Get Doug Schukars New Book. Douglas A. Schukar for FREE, please fill in the information below. e-Mail address is used for verification. "If you are a real estate agent, financial planner, or in any mortgage-related industry, you could do no greater favor for your clients than to give a copy of Know Thy Lender. I can't think of anyone who wouldn't benefit from reading this informative book." "A Valuable step-by-step approach to understanding more about lenders and how to work with them to your best advantage. If you own a home or are thinking of buying one, you should read this book." 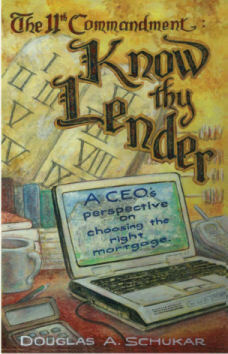 "If you are serious about finding the right lender and learning more about mortgage products, start by reading this book. It provides one of the most comprehensive, forthright and insightful analyses of the industry I have ever read." "An honest book that may be the best short course in everything you ever wanted to know about mortgage lenders and products but didn't know who to ask or where to turn."